Corona Secondary School, Agbara in collaboration with Headmaster Sports Academy Limited will in April, host over 300 students, between ages 10 to 17 at its expansive school premises in sport fiesta themed “Easter Soccer Camp”. The aim of the collaboration, according to the organizer, is to promote youth development and empowerment through education, to inculcate high moral and ethical values in students, both within and outside the wall of the classrooms, and to also enrich the sport portfolios of all participating youths and students. 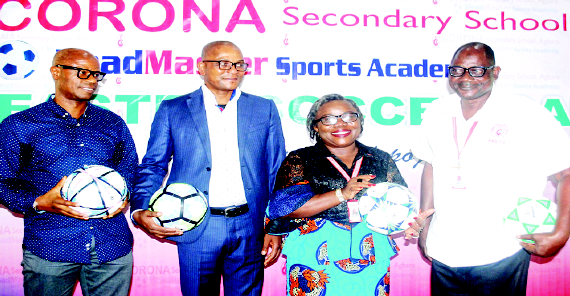 Speaking in this regards, the Principal, Corona Secondary School, Agbara Mrs. Chinedum Oluwadamilola said that the school agreed to go into partnership with Headmaster Sports Academy Limited because of the personality of Mr. Mutiu Adepoju. Oluwadamilola who described the ex-international as humble, explained that with Mutiu’s accomplishments in football, he has remained as humble as a dove. She said: “As an embodiment of humility, he has demonstrated that you can achieve a lot without making a lot of noise about it. You can achieve without been in everybody’s face, without been scandalous. And his records are clean. “This correlate with our school values and principles. ”Mutiu is one of a kind; to have spent so much time in top place football and there was never a time you hear anything scandalous about him, even as a rumour, it is commendable. “This is a typical example of a sport personality, we can encourage our students to emulate. As much as we want to expose our children to football, we also want them to learn from someone who has those good values that we resonate with. “During the camping period; which is only opened to youth between the ages of 10 to 17 years old, there is going to be a lot of scouts coming around to watch these boys and luckily, one or more of them could catch their interest. It is an open camp. ”Our students would be involved and interested students from other schools. They are to register through our website, www.coronaschools.org or via www.headmaster.ng with a registration fee as low as N3, 000 and participation fee of N75, 000 only. The camp is in two batches. “The first batch would open from 7th of April to 12th, while the second batch will be from 22nd of April to 27th of April with a limited space of 300 students per batch. “But the most amazing of all is that, the camp is not just going to be all about football, they would be learning moral values, discipline, more on attitudinal dispositions from the officials involved, how to get scholarships to European, Canadian and American universities through sport achievements, even as they interact with other ex-international footballers. So it is an intensive sport clinic and many more”. Meanwhile, the Ex-Super Eagles Midfielder/founder, Headmaster Sports Academy, Mr. Mutiu Adepoju expressed his delight to be associated with a programme aimed at improving the mind of our children in sport, adding that it would expose the youths to the value, ethics and the wonderful world of football. Speaking on his mission for the forthcoming event, he said HSAL in partnership with Corona has come up with soccer camp programme that is designed to connect, expose and integrate children into the international world of football. “The Youth soccer camp is a section of HSAL, which is established to create the best football experience for children by providing a solid platform in pursuing their football career, providing professional Coaches with the required equipment to train them in becoming the best both locally and internationally. “The benefits of this programme would include, training by professional coaches including myself and a host of others, vast exposure about the game, standard equipment, good training equipment, and chances to be scouted out by professional clubs by engaging in the international tournament.